1) This paper has been prepared for and presented at the FIG Working Week in Stockholm, Sweden 14-19 June 2008. Key words: land administration, good governance. In this new millennium, governance has gained significant attention on the global development agenda and is often considered a fourth dimension of sustainable development, adding to economic, social and environmental dimensions. Implementation strategies to address sustainable development aspirations and to meet Millennium Development Goals must be tailored to address varying development needs. Mobilizing the land sector is considered a principle focus for poverty reduction and a key development strategy in many countries. Land administration and management systems in particular, are responsible for providing tenure security and access to land for all. In addition these can provide accessible and equitable systems to mobilize land resources that ultimately assist in the alleviation of poverty. Good governance within land administration and land management institutions is essential for sustainable development both in terms of operational longevity, equitable stakeholder participation and benefits, and consistency in law and policy implementation. Land administration is often perceived as one of the most corrupt sectors in public administration. Land itself, considered a primary source of wealth, often becomes the trading medium and motivation for political issues, economic and power gains, and self fulfilling interests. The need to ensure there is good governance in land administration is thus very important. A key theme in the land sector among development professionals, policy makers and academics, is how to address governance within land administration. Current research and a draft Conceptual Framework design are presented in this paper to contribute to on-going discussion and provide a tool for focussing assessment of governance within land administration systems. This work is being undertaken under a contract with the World Bank. There is general acceptance that good governance is based on a set of objectives that include: participation; fairness; decency; accountability; transparency; and efficiency. Until recently, measures of good governance and measures of land administration reform effectiveness have largely developed in separate silos of thought. The Conceptual Framework consisting of eight objectives aims to reduce this gap using a range of examples from around the globe. A set of indicators will be agreed and pilot case studies will test these in late 2008, however these initiatives are not discussed in this paper. Attention is given to the first phase of the project which is to establish the Conceptual Framework for good governance in the land sector. It is almost trite nowadays to say that “land is a fundamental resource”. The huge social, cultural and economic implications arising from land rights-based issues, many stemming from poor governance, are leading international news stories. Whether one is in a developed or developing nation, land or property is often ones’ most important source of wealth and security. The concept of land as collateral to mobilizing capital is increasingly being embedded in developing nations. In addition to private wealth, the state economy, particularly at the local level, uses land fees and taxes as a significant source of government revenue. In terms of tenure security, formal recognition of rights can be vital for ensuring indigenous and other vulnerable groups have access to land. It can however initiate tensions of uncertainty between statutory and traditional groups or customs. Often the intense and conflicting demands on land resources are not well balanced. Land continues to be the basis of frequent social upheaval. Therefore much effort has been devoted to developing systems to administer land rights their use and value. In most developing countries secure property rights are undermined by weak governance practices. Overlapping laws and regulations, weak institutions, limited accountability, and incomplete property registration systems create a fertile environment that lacks transparency. This environment gives rise to petty corruption as well as grand misuse and/or misappropriation of public resources. Petty corruption starts with low level government officials working in registration and taxation agencies seeking informal payments. This increases the cost of doing business and undermines the business environment. There are higher stakes where public resources are concerned, as weak governance in land administration enables political elites and senior government officials to illegally grab state properties, seeking large bribes in return of leasing or transferring state properties to investors. Often these acts also involve by-passing of development controls which can seriously affect vulnerable groups whom are unable to defend themselves or are unable to demand appropriate compensation. Weak governance will affect the poor in particular and may leave them marginalized and outside the law. Good governance in land administration is central to achieving good governance in society. ‘Senior politicians and public servants in cities all over the world manipulate or ignore the law and administration relating to land allocation and development so as to line their own pockets and those of their families, friends and political allies’ (McAuslan 2002:27). Factors associated with governing land administration are numerous and complex. Untangling these factors, finding a balance towards cooperation between private, state and other interest groups and applying contextually appropriate concepts of good governance in land administration is being attempted in this current World Bank study. The scope of the study is much broader and more comprehensive than what can be delivered in this paper, the process in developing the Conceptual Framework, which is presented, may be considered as important as the end result. The process has involved developing a draft Conceptual Framework and indicators to measure governance in land administration; testing this draft framework and the indicators in five country case studies; analysing the results; and finally presenting recommendations of a Framework that will be useful for assessing governance in nations around the globe. Developing the Conceptual Framework is an ongoing process. Initially it is shaped by desk studies of conceptual and empirical material to provide an overall project approach and deliver a comprehensive explanation of each objective that describes governance in land administration. It will be developed through open discussions, case study pilots in a sample of diverse countries and analysis of the field results. In this paper, we are able to present the key concepts of the study and approach, and an initial set of guiding objectives to consider in the assessment of good governance in land administration. The essence of land administration typically involves processes that: manage public land, record and register private interests in land, assess land value, determine property tax obligations, define land use and management governance systems, and support the development application and approval process for land use. Land administration systems should perpetuate policies of tenure security and access for all. Land management on the other hand is associated with the activities on the land and natural resources, including such activities as land allocation, use planning and resource management, simultaneously considering some inherent aspects of land administration. Land administration systems provide a set of tools that support land management. These tools typically operate within a country specific framework established by land policy and the legal, social and environmental background of a particular jurisdiction (Burns 2007). During the last decade, a common understanding and practice of land administration has evolved. Recognising there is no blue print or ‘one size fits all’ model; there may be some applicable ‘best practices’ associated with the different system tools. Using land administration principles as a platform, how does one then adopt principles of ‘governance’ to shape a Conceptual Framework, particularly one that will be used as the scope to measure performance? An appreciation of the separate silos of governance principles is required and then combining these using an understanding of existing operational encounters and functional arrangements. It is even more difficult to define ‘good governance’. Therefore it is generally accepted that good governance is based on a set of principles that include: participation; fairness; decency; accountability; transparency; and efficiency. Often references are also made to responsiveness, consensus orientated, equitability, inclusiveness (UNESCAP) and subsidiarity. There is an increased agenda on embedding ‘good governance’ into programs, projects and the functioning of institutions, some attempts have been made to integrate these principles within land administration reform strategies. The most definitive efforts to apply the principles are reflected in FAO’s recent Land Tenure Series Publication, “Good governance in land tenure and administration” (2007). Prior to this UNHabitat launched the Global Campaign on Urban Governance in 1999 to support the implementation of the Habitat Agenda goal of “sustainable human settlements development in an urbanizing world.” A key outcome of this campaign was the Urban Governance Index (UNHabitat 2004). Governance is an integral feature of improving strategies to meet Millennium Development Goals. As a result the Oslo Governance Centre was established as part of the UNDP’s global policy network for democratic governance under the Bureau for Development Policy, and other organizations are following suit. Other projects and activities of organizations such as IFAD, IFPRI, ILC, and FIG are contributing to the dialogue for innovations on improving governance in land administration. Donor governments and agencies also have a high stake in developing analysis tools for governance in their aid programs where land sector components are often substantial. An example of this is the Millennium Challenge Account that attempts to pre-qualify countries to determine their eligibility for development assistance using five key principles of good governance. These good governance principles are: free and fair elections; independent judiciary and the rule of law; freedom of speech and press; absence of corruption; and government investment in basic social services. In a summary paper by Dobriansky (2003), it is stated that “[t]hese principles constitute the foundations of modern democracy and create the underpinning to establish capital markets and spur foreign and domestic investment.” (Dobriansky 2003). While this may be considered a narrow interpretation of the aims of ’development’, it does echo the development agenda of numerous governments. Land governance from the traditional sense can be loosely defined as the range of political, organizational and administrative processes through which communities articulate their interests, their input is absorbed, decisions are made and implemented, and decision makers are held accountable in the administration, development and management of land rights and resources and the delivery of land services. Governance involves an analysis of both formal and informal actors involved in decision-making, the implementation of decisions made and the formal and informal structures that have been set in place to arrive at and implement the decision. Development practitioners of all persuasions recognize the importance of governance and the rule of law as an essential precondition for economic and social development. In many contexts, land is identified as one of the most corrupt sectors together with the judiciary and the police. Still, given the complexity of land issues virtually everywhere and the fact that institutional arrangements are highly country specific, no systematic guidance is available to diagnose and benchmark land governance and to contribute to improving it over time. The overall approach used in this study for attempting to achieve this systematic guidance is summarized in Figure 1. The development of a conceptual framework began with a comprehensive review of land administration systems, both formal and informal and of recent project experience in strengthening land administration systems. Informed also by the governance literature, central to the Conceptual Framework is the development of a coherent set of eight statements that set out objectives for good governance in land administration. These eight objectives are discussed in Section 4. These formed a platform on which key policy questions could be developed for country level investigation. These key policy questions, whilst superficially appearing to be simple yes/no responses are expected to be far more complex responses of either ‘yes, but’ or ‘no, but’ followed by an explanation of circumstances not covered by a simple ‘yes’ or ‘no’ response. In addition a a set of numerical indicators that assess the status of the objectives in good governance are to be developed. The information gathered in responding to the key policy issues and quantitative indicators for each of the country case studies will be used to develop a strategy for good governance in land administration for that country. Strategies remain based on the global governance framework but with country specific relevance. In designing the Conceptual Framework it is important to consider how a country-based application of the Framework can contribute to informing decision makers on how to improve governance in land administration for that jurisdiction. Development and governance assumptions can be contextualized greatly by studying the political economy and addressing the externalities impacting on various situations. Central to the Conceptual Framework approach is the two pronged approach stemming from the objectives. One area concentrates on an assessment of the political economy, primarily looking at factors affecting the historical and current land administration arrangements and policies, land market activities, and other social and economic drivers of development of the country. The second considers empirical data guided by more quantitative studies that will result in producing an indicator for comparative assessment, preferably indicators that can be replicated for comparison over time and possibly locations, whether these are inter or intra-regional. Integrating studies of the policy context and an analysis of other indicators is necessary to evaluate underlying causes or rationales for a specific quantitative indicator. For example, a low indicator for the number of registered transactions as a percentage of registered properties could be due to a number of factors: poorly developed land markets; low land market activity; little participation in the formal system (which could in turn be due to high transaction costs and/or an inefficient land administration system); low community awareness etc. Governance in land administration certainly does not occur in isolation to other levels of development and a range of social, political and economic constructs. 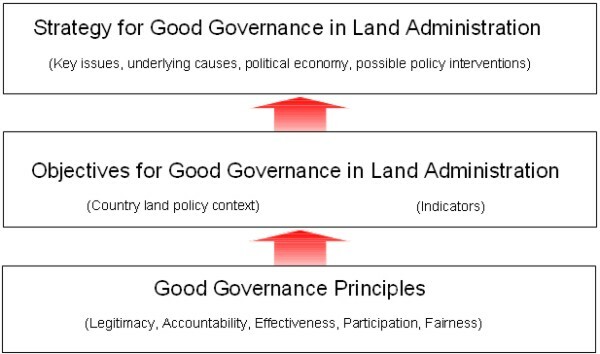 The main objectives and development of the indicators should not be considered solely in terms of land administration ‘best practice’, but what is “good enough governance” (Grindle 2007) and what alternatives may be more applicable. The framework should be approached as an assessment tool that is considered along a continuum of various stages of achieving good governance throughout land administration. Therefore, pragmatic and tangible reform strategies in the context of the stage of development of a particular country can be derived. The focus at this stage of the project is developing a set of statements that set out a coherent framework of objectives for good governance in land administration. Indicators will develop as a result of an accepted set of objectives that can be consistently investigated at the grassroots level. The following statements for eight objectives for good governance in land administration have been developed. The objectives are based on experience with projects in the land sector and have been refined during the study in discussions with a broad cross-section of stakeholders and participants in the land sector. The objectives of good governance were also developed from an understanding of the implications of ineffective, inequitable and poorly functioning land administration systems. Weak governance in land administration is a key contributor to issues of: informal modes of service delivery, corruption, illiquidity of assets, limited land markets, tenure insecurity, inaccurate and unreliable records, informal settlements, unrealized investment potential in property, land speculation and encroachment, idle and unproductive use of land, inequitable land distribution, social unrest, and inadequate provisions of infrastructure. While this list of issues is extensive, it is not exhaustive. There are numerous more direct and indirect negative impacts as a result of poor governance in land administration. Land management and associated instruments (zoning and development control plans, conservation plans, etc.) are justified by externalities and undertaken in an efficient, transparent manner. Judicial and non-judicial institutions are accessible with clear mandates and resolve disputes fairly and expeditiously. Land policy is the foundation on which the systems in a country for land management, land administration and land development are built. Policy endorsed by a high authority should be based on principles of good governance focusing on efficiency, equity and accountability. The implications of weak governance from deficiencies in policy include tenure insecurity, encroachment and exclusion on access to land, informal modes of service delivery, limited land markets, increased administrative corruption and state capture, and increased land disputes. Functional ambiguity among institutions often equates to agencies acting unilaterally and out of touch with community expectations and desires. Land policy typically has to recognize that there is a variety of land tenure regimes in a country. In practice, a continuum of tenure rights can be observed, especially in the context of developing countries where different sources of law and different tenure regimes may coexist. There is thus a diversity of tenure situations, ranging from the most informal types of possession and use to full ownership. In most countries land is administered in a number of separate systems or ‘silos’. These silos include the important silo that registers private rights in land. Other silos that might exist in a country include those that administer: public land, land reserved as forest land, land reserved for protected areas, land held under customary tenure, land used for agriculture and land used for mining. Much of the uncertainty in rights in countries with administrative ‘silos’ is due to uncertainty regarding the extent of the jurisdiction for each silo and overlapping silo jurisdictions. A key strategy to address the problems arising from administrative silos, particularly in an environment of limited rule of law, is the adoption of a holistic approach to land administration through policy formulation and/or legislative reform. National land policies and comprehensive legislative frameworks have been developed in many countries, particularly in Africa where about 15 countries have formulated new land policy and enacted in the past two decades new legislation which recognizes existing and future private property rights. This has involved significant effort and consultation. However this effort has often resulted in little change in the formal recognition of rights. In Africa a large part of the problem has been difficulty in funding and implementing the new laws. An alternative approach to the holistic approach to policy formulation and legislative reform is developing policy and legislation in a piecemeal approach. This is the traditional approach to policy development in developed and developing countries. This approach involves the development of a policy and legal framework to register or record a set of specific rights in a defined locality and is typically implemented by developing procedures and building stakeholder support through a series of pilot studies. This objective is concerned with the legal recognition of property rights, the consonance between the rights recognized by the legal statutory framework and the rights on the ground that have acceptance and legitimacy in the community and the enforceability of the legally recognized rights. The legal recognition of rights is very much related to power structures in the community. Informal settlements, informal building and construction and tenure insecurity are key implications of weak governance in this area. Weak governance in the legal framework for land opens gaps for speculation, unproductive use of land, and a lack of clarity in rights leading to social unrest and land disputes. The economic, social and environmental implications can have a widespread impact on government and the community. There are many projects that have successfully implemented programs to systematically register rights. These projects cover a wide number of countries, including Thailand, Lao PDR, Indonesia, Honduras, Peru, Armenia, and Kyrgyz Republic. The systematic process, which is typically undertaken as an open process for the whole village or community, is usually more transparent than the traditional sporadic approach. The systematic approach provides the metrics for a production process with checks and balances. A systematic process is also most cost-effective, particularly where geodetic control or base mapping is required. A key requirement for an efficient systematic process is the fact that the teams in the field have clear rules to establish rights. Many of these rules are based on the recognition of long-term occupation rather than the provision of documentary evidence. Pilot activity is an important strategy to build capacity by developing and field testing efficient procedures, and building stakeholder support. A key lesson from several projects is that municipal and administrative boundaries and easements should be defined as part of the systematic registration process. In many countries changes in other requirements such as planning norms and standards are necessary before formalization can be undertaken. Although there has been success in systematic registration in many countries, fewer countries have been able to keep property in the formal system and encourage a ‘registration culture.’ In many countries there is often a long list of unclear prerequisites for the registration of rights and frequently there is a great deal of official discretion in how these prerequisites are interpreted and implemented. One strategy that has been implemented to address this problem is the establishment of one-stop-shops (OSSs), where an OSS is a single point of contact that manages the processes required to obtain the necessary approvals. An alternative approach to formalization or systematic registration is to focus on tenure security rather than regularization. This particularly applies in the case of informal settlements in urban and peri-urban areas, but also to areas under customary and common property regimes. An approach based on tenure security might combine: (i) the provision of both personal rights (such as temporary or permanent permits to occupy, short term leases) and real rights (freehold, surface rights, long-term leaseholds); (ii) the provision of individual rights and of collective rights; (iii) the provision of transferable and of non-transferable rights. Community understanding of the land rights that are recognized by law and the associated processes to give effect to the legal recognition is essential. The laws need to be consistent with local customs. Gaining an understanding of community practices and concerns is an important first step, particularly in countries where the formal system is neither efficient nor well regarded. Best practice in community awareness includes a comprehensive web page, a customer relations manual that is available to all staff, media training for senior officials, a range of promotional material including posters, brochures and media campaigns on national and local television and newspapers. In less developed countries efforts have focused on village meetings and village plays. Policy needs to be developed for parcel boundaries and the status of survey records in re-establishing boundaries. One of the dangers of increasing accuracy and decreasing cost of surveying and mapping technology is the specification of a standard just because it is technically possible rather than because it is needed. Experience in many countries suggests that survey accuracy is not a major concern. No project in the developing world has been able to implement and sustain high-accuracy surveys over extensive areas of their jurisdiction. Those countries that have been successful in registering significant numbers of titles have tended to concentrate on relatively simple, low cost survey methods and produced graphical standard cadastral index maps. Land management and other instruments, including land use planning and zoning instruments, are justified by externalities and are implemented efficiently and transparently. The land management and administration systems become the foundation for the hierarchy of other instruments which support a wide range of natural resource use rights for activities associated with land, air and water. These include land use zoning, site development, allocation and use of air space, the allocation and use of water resources, and the use and exploitation of fish, forest, mineral and other natural resources. Each level of rights in the hierarchy is accompanied by more a specialised land management governance system because they represent value adding in different markets and economic systems. Land management is regulated by imposed land use planning and associated development restrictions. Effective land use planning must be in line with community needs and undertaken in a participatory way. The consequence of poor land use planning is informality as people will find informal means to cope with their needs, particularly when planning designs inadequately predict or supply the necessary infrastructure. Issues affecting land use arrangements, which often directly affect people’s livelihoods, can result in high levels of social unrest. There are also often problems enforcing master plans as they are either developed without due consideration of implementation arrangements and capacity or developed in a non-participatory approach that meets strong community resistance. Similarly, zoning restrictions should be justified by external effects, and determined in a transparent and participatory way. Regulations and restrictions should be made in line with the capacity to enforce them. Other forms of formally recognized rights, such as airspace rights for apartments have become important instruments for property development in cities, especially where the supply of approved, serviced land sites is typically a constraint. However, in many developed countries and the former socialist republics, the selling off of rights to apartments without proper governance arrangements has given rise to significant building maintenance and redevelopment problems associated with old and unsafe apartment blocks. Some countries have moved to register water right allocations and to establish a water trading market to enable water rights attached to land to be traded, often in a manner that is independent of the land itself. Water rights are now becoming a major issue in China, India and other South East Asian countries, with several river systems no longer flowing and water demand dangerously depleting minimal environmental flows. Development of controls on many of these rights will be extremely difficult generally given the lack of or poor state of formal land records management systems and particularly in regard to planning schemes and the provision of public assets under these schemes. In all developed and developing countries there has been a gradual evolution in the systems to recognise rights for the exploitation of natural resources. This evolution has occurred in parallel with the development of systems to recognize private rights in land and in the wider policy context of the management of common pool natural resources, the recognition of and disposal of public land, and tax and fiscal policy. There has been a general trend to separate systems to allocate and exploit natural resource from the systems to recognize land rights. An example of this is the policy introduced in the nineteenth century in most developed countries to separate mineral rights from land rights. A more recent example is the separation in many countries of water rights from land rights. The systems introduced to support these policies are models for many developing countries. The recent initiatives to recognize and support carbon trading and growing concern about climate change will add increased emphasis on the need for improved systems for recording natural resource rights and distributing the benefits from the allocation of these rights. Land administration will only operate at an optimum when the roles and responsibilities of all interested agencies are clear, unambiguous and followed accordingly. This applies both horizontally between agencies and vertically between levels of hierarchy, factoring in private sector and community involvement. Introducing good governance techniques into public sector organizations often requires widespread changes. A common approach in land administration reform activities is to streamline services. This often requires merging of agency responsibilities into a single “land” agency, introducing new technology and strengthening human resource capacity. Introducing civil service standards and codes of conduct are two methods to improve operational accountability in the area of human resource capacity. Effective mechanisms are required to ensure the behaviour of land administration institutions is managed and to eliminate or minimize any negative social impacts of the services provided. Monitoring institutional behaviour in the public sector is often a low priority in developing countries. Without appropriate mechanisms, weak governance can lead to administrative corruption and “financial leakages”, overloaded courts, indeterminate dispute resolution, limited protection for the vulnerable, an ineffective implementation of policy and laws and ultimately social unrest. Cost-effective, accessible and reliable service delivery by land institutions is an important attribute to an overall measure of governance in land administration. Service delivery, most often provided by a government institution, should also be widely used by the public and other institutions. Broad participation in services represents equity of access regardless of authority, wealth, location, ethnicity or gender. The impact of poor governance within a land administration institution is often reflected in poor service delivery. Issues include user uncertainty, a lack of public trust and participation, slow service delivery, high and uncertain costs and an unsustainable system. The overall process of service delivery should be seen as business rather than bureaucratic processes. Streamlining of process flows is an essential part of achieving efficiency. Computerization may be a means to doing this, but more readily, this should be undertaken as a complementary tool. A large part of effective service delivery is good records management. This is essential for maintaining the integrity of secure tenure through property rights registration. Record data should be simple and unambiguous. The actual records should be easily identifiable and retrievable. Dealings with records need to be undertaken according to a set of standard procedures that are set out in operational manuals. A comprehensive set of procedures should include variations to procedures caused by technology, levels of authority and the location of services. The system should be readily accessible to those registering dealings, considering costs as well as information and procedural requirements. A cost structure needs to be applied that is not an undue barrier to participation. Physical access often requires some level of service to be decentralized. Options of one-stop-shops, private-public-partnerships for front office services, local lodgement points and mobile services are different strategies that offer services close to the public. Registration procedures need to be clearly understood by the general public without the unnecessary involvement of external professional service providers. System sustainability relies on a guarantee of financing to maintain services and operations. This may be achieved through external government budget allocations or self funding structures. Institutions aiming for the latter financing strategy typically demand a reform of the system that addresses inefficiencies and the effectiveness of service delivery. Involving the private sector in service delivery is one approach possible where contracts are well designed and managed. Capacity building options within the government sector should emphasize efficiency improvements and quality and these strategies should not be limited to technical procedures but involve management resources also. Information leads to empowerment. Empowerment means that people can make informed decisions, they have knowledge and capacity to participate, and are able to question decisions which may affect them. This is particularly relevant to the poor who often lack vital information, communication mechanisms and visibility to voice their concerns (UNDP 2003). Broad access to information is also critical for policy making. Public dialogue and disclosure of information between government sectors is important. Increased access, information sharing and dialogue assists policy development to ensure policies reflect the needs of the people. Similar to the effects of weak governance on service delivery, issues arising from a lack of information include public distrust, lack of oversight, poor data management, and under-utilized data for decision making in both government and private sectors. Quality and reliability of data in the public arena requires a level of control in the maintenance and dissemination of data. Therefore roles, responsibilities and obligations of data custodians of information should be clear in both the public and private sectors. An industry model to set data security and cost structures between ‘free’ versus ‘fee’ public information, and access and dissemination policies for onward use of the data should be considered at high level. Broad access to information is an empowering and participatory mechanism for a land administration system operating under conditions of good governance. Strategies for ensuring accessible information are overcome in theory once there is general consensus by government at a high level that public records should be made available upon request. Once a positive decision on access is made by a government that balances privacy, security and public access concerns, access strategies can be readily put in place. Practical obstructions to access information are acknowledged as an issue in many countries particularly where there has been a long period of poor record management. Access to any public information should be up-to-date, unambiguous, and reliable. Computerization strategies are very useful for supporting public information access policies as they can significantly improve storage, access, retrieval and sharing of data, both spatial and textual. Computerization is also essential for web based access. Ensuring adequate resources are available to support computerization and ongoing maintenance is critical. This also requires systems be in place to integrate decentralized operations whether they are manual or automated. The cost of this reform strategy should ensure that those costs passed on to the consumer are not overly onerous. Accessible and easily adaptable information will increase demand for its use in decision making. As with first registration, during the early stages of computerization and publicly accessible data, costs should be minimized to encourage participation and increase demand for the formal system and services provided. Generally, public land and other public assets are badly managed throughout the world. There is limited awareness of both the consequences of weak governance in public land management and how to improve the situation. Public land is often treated as a “free good”, whereas “good” land in terms of location, use and service delivery is in fact scarce and valuable. State land allocations are often not undertaken transparently. The state may be stripped of its assets through “land-grabbing”, i.e. the transfer of state land into private hands through questionable, if not illegal, means. Illegal land exchanges usually leave special interest groups favoured in land and other natural resource concessions. There may be political interference in management decisions, and compulsory purchase may be used inappropriately to further private interests. The possible impact of illicit misappropriation of state assets on development processes and poverty eradication is enormous. It has both direct and indirect negative impacts on development. Economic and social impacts, including social unrest and disputes are widespread due to illegal allocations, disposal and use of public land. Public land management is a critical factor for ensuring good governance in the administration of land in a country. There are common factors involved in poor public land management. There is typically ambiguity in authoritative roles and responsibilities, a lack of accountability or methodology in the systems of allocation, appropriation, disposal or use of public land, and a lack of information on state assets. Weak governance in this area has direct and indirect implications for citizens, and broader effects on economic development, political legitimacy, peace and security and development cooperation. There are a number of elements that can be applied to a strategy for developing good governance in this area. These elements are applicable to any country situation or stage of development. While the following strategies have good intentions, reform is difficult as key stakeholders in the equation often have vested interest in keeping the status quo. Therefore, these suggestions are best applied in parallel within a whole-of-government “good governance” strategy. Property valuation and taxation has important implications for governance in land administration. Land resources in all societies are finite and a fundamental basis for social and economic development. An equitable, fair and easily understood taxation system is more likely to have willing participants, than an unclear and non-transparent system. Poor systems for property valuation and taxation can be an indication of poor governance in land administration. These lead to uncertainty in market prices, difficulties in valuing property, constrained land markets, increased land disputes and appeals, loss of revenue and inequitable property tax burdens. Valuation procedures provide the framework for statutory valuation purposes and should be transparent and fair. Different methods for valuing property depend on the sophistication of the property market. A standardized method should nonetheless be chosen that covers all property. Valuation information or sale values should be made publicly available to improve transparency in the property market. These elements are necessary to remove the common practice of under-declared values associated with high property transfer fees and taxation rates. Land administration systems should aim to assist the resolution of disputes over land. Mechanisms to resolve disputes may be available through the judicial system or alternative administrative systems. These mechanisms must be accessible, unbiased and efficient in resolving disputes for all citizens. During initial adjudication of property rights, local level adjudication teams that work directly in the village with local authority is an effective strategy for resolving minor boundary or rights disputes to advance formal registration. Strategies for dispute resolution must be culturally sensitive and guidelines should be prepared to assist mediations that encounter conflicting issues between customary and statutory laws. This paper presented the current approach taken in attempting to translate governance into the land domain. Drafting a Conceptual Framework will create an investigation platform for governance in land administration. This framework can then be integrated in various country contexts to help in the identification of structural deficiencies that lead to unsatisfactory performance in the land domain. This can be used to devise more complementary policies to ensure positive outcomes within the land administration domain. The draft Conceptual Framework has undergone rigorous consultative process with a range of land administration experts. In the main draft Conceptual Framework document, of approximately 180 pages, each of the eight objectives are comprehensively illustrated using current practices and project examples, largely from World Bank experience. The eight objectives and study approach highlight the key themes and sub-themes and how these themes are interpreted in terms of the implications where governance is lacking. The scope largely interacts with fair policies, legitimate rights, participatory land management, transparent institutional functioning, especially in terms of public land management, information access, clear and efficient land valuation and taxation and equitable dispute resolution procedures. Continuing with the development of this draft Conceptual Framework requires further economic analysis. Following this, the next phase will concentrate on developing a final set of indicators and a rigorous methodology to conduct country case studies which assess governance in land administration. This paper is based on preliminary findings from a broader study on land sector governance by the World Bank’s Agriculture and Rural Development Department, with support from FAO, UN-Habitat, and other development partners. The views expressed here are those of the authors and do not necessarily represent those of the World Bank, its Executive Directors, the countries they represent, or of any of the supporting institutions. The authors appreciate the comments and advice of the Bank team as well as other members of the project advisory committee, case study authors, and comments from the public during the e-conference. A number of authors are contributing to the development of the Conceptual Framework and there experiences and wisdom are greatly appreciated. Burns, T., 2007. Land Administration Reform: Indicators of Success and Future Challenges, Agriculture and Rural Development, Discussion Paper 37, World Bank. Dobriansky, P., 2003. Principle of Good Governance, Economic Perspectives, March. FAO, 2007. Good Governance in Land Tenure and Administration: Land Tenure Studies 9, Rome, FAO. Grindle, M. S., 2007. "Good Enough Governance Revisited." Development Policy Review 25(5): 553-574. McAuslan, P., 2002. “Tenure and the Law.” In Land, Rights and Innovation: Improving Tenure Security for the Urban Poor, ed G. Payne. London: ITDG Publishing. UNDP, 2003. Access to Information, UNDP Practice Note, prepared for UNDP. UNESCAP, -. What is Good Governance?, Poverty Reduction Section, Bangkok. UNHABITAT, 2004. Urban Governance Index: Conceptual Foundation and Field Test Report, August. As founding and Managing Director for Land Equity International, Mr Burns has over ten years involvement at management levels on multilateral financed land administration, tilting and policy projects. He is the Team Leader for the Governance in Land Administration study (Oct 2007-Nov 2008). He has over 20 years experience in land management and natural resource projects covering the full project cycle, and is an expert in project design, land policy review, evaluation of cadastral survey and mapping procedures, land titling, land administration and spatial information systems. Mr Burns also has interest and experience in management of change, performance auditing and assessment of project implementation against objectives and milestones. Mr Burns recently authored a World Bank, Agriculture and Rural Development Discussion Paper on “Land Administration Reform: Indicators of Success and Future Challenges”. Kate is a Senior Land Consultant at Land Equity International currently working on assignment in Lao PDR on the Laos Land Titling Project Phase 2. Kate also provides technical support and assistance to the Managing Director and team leaders contributing to the research dialogue and development of land administration strategies and policy.